Nikolaus [Nicolas, Nicolaus, Niklas] Herman [Hermann] was a German writer of hymn texts and melodies. From 1518 to 1560 Nikolaus Herman was schoolmaster, organist and Kantor in Joachimsthal, Bohemia, just over the mountains from Saxony. 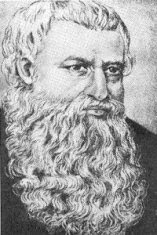 Johann Matthesius, Luther’s first biographer and headmaster of the Latin school there from 1532, was also, until 1565, minister of the church; Herman was associated with him both as a close friend and as a colleague, and thus came into contact with the Reformation from an early date. As early as 6 November 1524 Luther wrote to him as ‘viro pio et erudito’. Toward the end of his life he suffered greatly from gout, and had to resign even his post as Cantor a number of years before his death. Nikolaus Herman’s importance lies in his hymns, which were published in several volumes. He wrote both text and music, but most melodies are used for several texts. His poems are rhymed syllabic verses with no fixed metre. His Sunday Gospels, which retell Bible stories in rhymed stanzas, remained models for a succession of works of the same type well into the 17th century. In his endeavours to express Christian beliefs in the form of hymns Herman’s texts are close to those of Luther. Though never attaining the poetic force of the latter’s work, many have retained their place in the standard German Lutheran hymn repertory: above all Lobt Gott, ihr Christen, allzugleich, Erschienen ist der herrlich Tag, ‘Die helle Sonn leucht jetzt herfür’, ‘Hinunter ist der Sonnen Schein’ and Wenn mein Stündlein vorhanden ist. Many of his melodies show clear affinities with folk music: in particular the traditions of Bergreihen (songs in folk style from the region of the Erzgebirge between Saxony and Bohemia) and Abendreihen (evening dances sung in a circle). In a number of melodies he employed elements of plainchant, sometimes alongside folk elements. Thus his well-known tune for Lobt Gott, ihr Christen, allzugleich is probably connected with the Christmas antiphon Hodie Christus natus est nobis, while that for Erschienen ist der herrlich Tag is at least indirectly related to the Easter antiphon Ad monumentum venimus gementes.